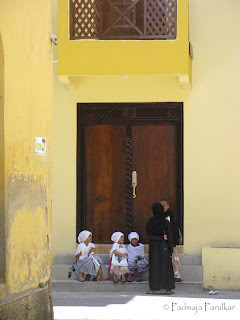 If Gede is time standing still, tending backwards, then Old Town is time carried forward in a past-present continuum. This becomes particularly evident from where I am standing - at a junction where four strands of Kenya’s historic past meet. 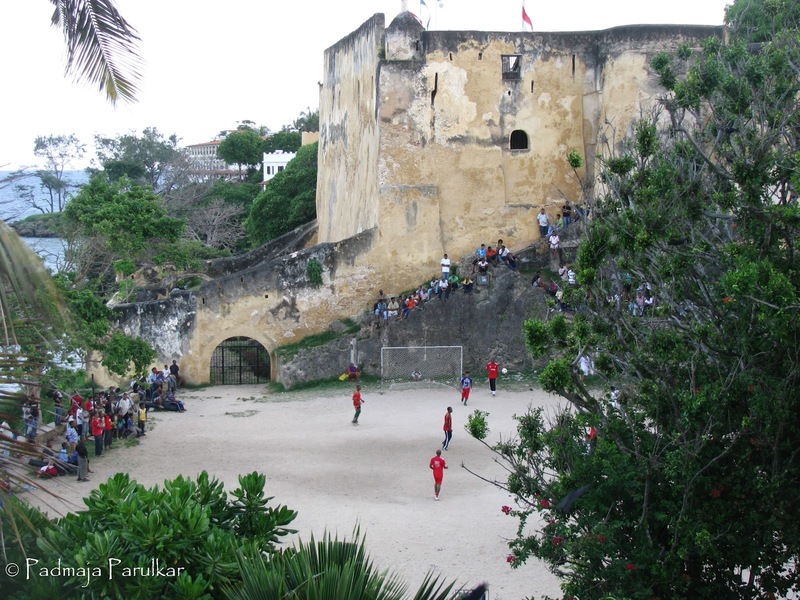 On my left is the 16th century citadel, Fort Jesus, built by the Portuguese; behind me is the colonial (British) Mombasa Club; and to the right is the entry point to the Old Arab Town that boasted sizeable Indian population and influence when it sprung up by the East African coast of Mombasa around 18th century. The junction, itself, a traffic island, is an oddity as it immortalizes, not a person, but a legendary institution. A giant golden coffee pot stands in tribute to a ritual from the hoary past, of people that cherished its kahawa. 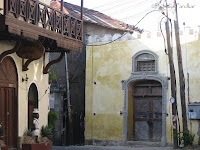 And here it is, in a macrocosm away from the hum of modern Mombasa, right next-door, that I rendezvous with Taibali Hamzali, an old-timer Old Town-er. An architect with a yen for heritage conservation, he has been working towards preserving the buildings and the ethos of Old Town, which is today a UNESCO heritage site. Brought up in its intimate and intricate bylanes and alleyways, there couldn’t have been a better guide, for me, today. As we step into the Old Town, it feels as though we have stepped into a film studio from yesteryears, and it may well have been a Bollywood tableau! Fragile, dainty single-storey houses with overhang balconies and balustrades, ornately carved doors and even Art Deco buildings momentarily confound me. Is this Kenya in Africa or am I in small-town India of the colonial era? Either way, I am excused. Because, this settlement which sprouted by the waterfront and grew organically, a century ago, is a rich amalgamation of the varietal peoples and their cultures - Arab-Omani, Indian, British - that touched its shores, not to forget the indigenous Swahili influence! Further North, by the waterfront stands the majestic Leven House, the seat of erstwhile British colonial administration where missionaries such as Johann Krapf and explorers, John Speke and Richard Burton, stayed when they passed through onward to hinterland. 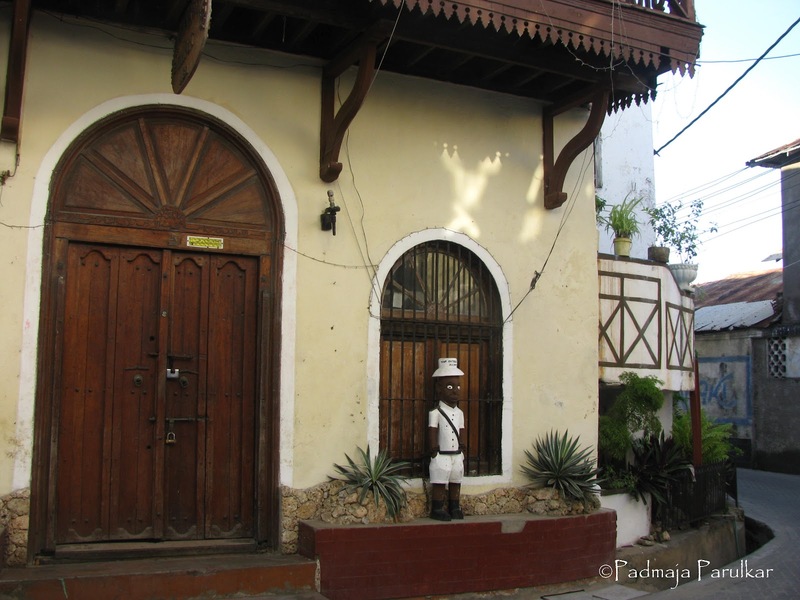 Today, this renovated building is the office of the Mombasa Old Town Conservation Office, which is doing a fine job of preserving the past. 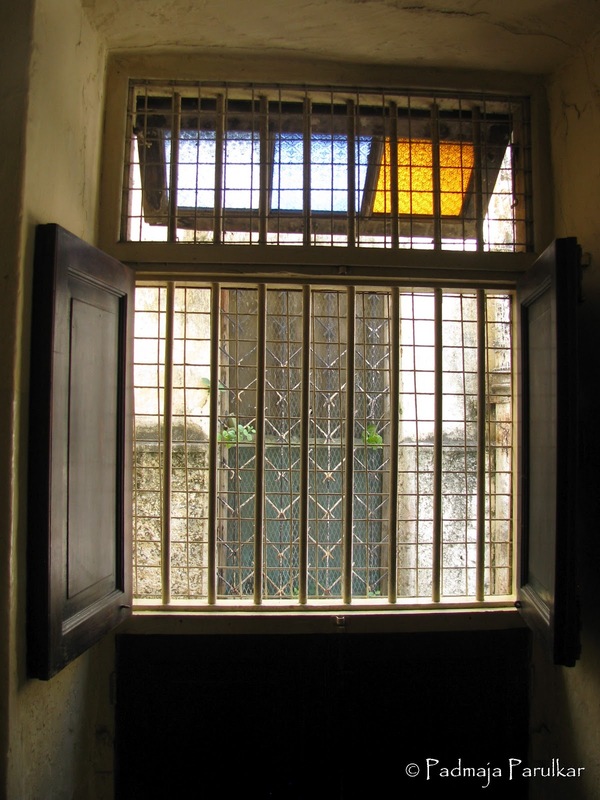 As we wind and wend our way through ever-thinning pathways we are thoroughly awed by the fretwork balconies and the doors - mainly the teak doors with brass studs. Adorned with Arabic-Koranic inscriptions at the top and designs of floral vines twirling throughout the framework, these were crafted by Kutchi craftsmen. I am intrigued by one particular carved door as this is on the periphery wall and is sealed, incongruously, and must open into the ocean. 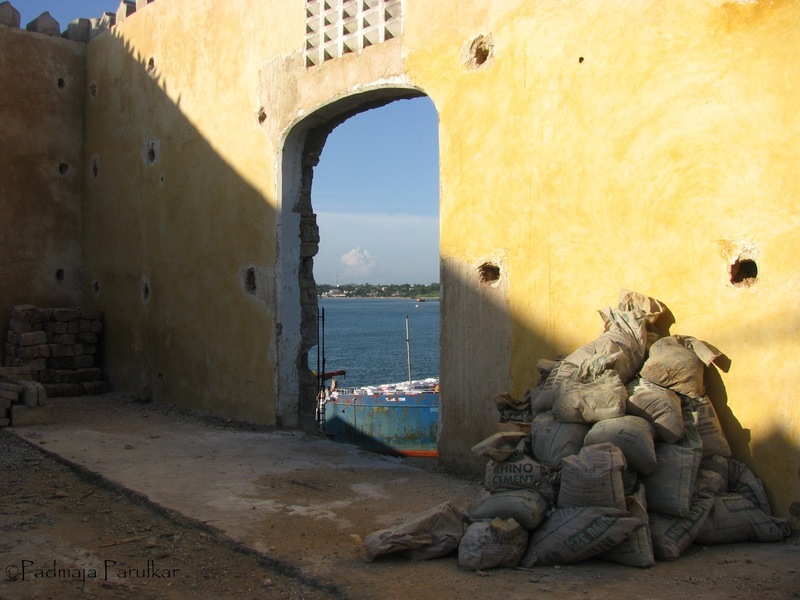 Taibali reveals the ugly secret behind this closed door, a black mark on Africa's history. Slaves were shipped from this point to Zanzibar. The street-scene is enlivened by Swahili women in buibuis, and others flaunting boldly patterned khangas in floral prints. Little school-going girls, innocent and giggling, covered from head-to-toe, cut a cute picture in sync with the character of the old town. The men, in their kikois and kanzus go about their daily activities of trading and selling wares, which in today’s times translates as curios and souvenirs for the tourists. 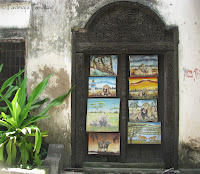 In fact, most of the buildings house curio shops on the ground floor, dealing in wood carvings and handicrafts, trademark of Kenya’s Akamba tribe. The only way to wash down such a time travel is to sit with a cuppa coffee and mull over its import. Jahazi Coffee House presents that perfect intellectual space as it is not just a café, as the name suggests, but a cultural meeting ground. 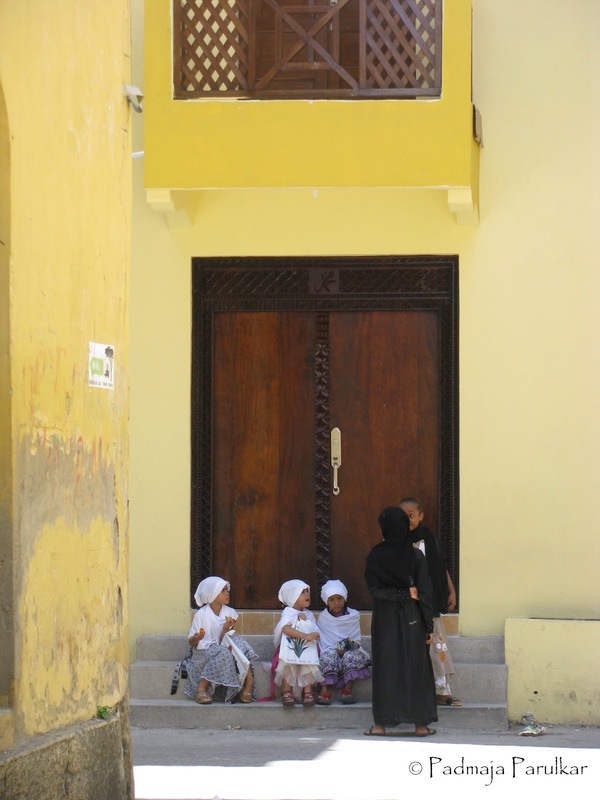 Jahazi, Persian for ship, is a Swahili adoption, like other umpteen words that populate the KiSwahili tongue and are borrowed from the Persian parent or even Hindustani, for that matter. Bedecked with Lamu benches and coffee tables, Persian carpets and settees, it creates an ideal setting to idly watch the old world go by. And then, there is the kahawa, of course. 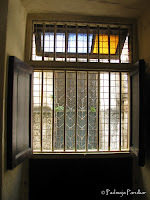 Sitting by the painted glass window of Jahazi house, sipping coffee, a whisper from the past gently nudges me. I can see it all vividly now. At the end of the day’s work, men, women and children - Old Towners - sit by the ocean and unwind in the evening breeze. The coffee-seller carrying his trademark brass coffee pot with coals blazing in the brazier beneath peddles strong ginger-cinnamon brew to the strollers and idlers. Even as I end the day at Mombasa’s Sailing Club, amid coconut palms and almond trees, I see local boys in red jerseys playing football in the historic precincts of Fort Jesus, which had witnessed many a battle between Omanis and Portuguese. As the ocean waves crash onto the fort’s façade the setting sun freezes the moment into a perfect picture - a pastiche of present peeled out of the past.